The fuel-free aeroplane Solar Impulse has arrived in Nanjing in the east of China. 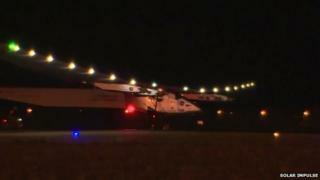 Pilot Bertrand Piccard set down the prop-driven vehicle at 23:28 local time (15:28 GMT), following a 1,240km journey from Chongqing in the west of the country. The project is aiming to circumnavigate the globe, and it must now prepare for the challenge of crossing the Pacific. The next 10 days will be spent giving Solar Impulse a thorough servicing. Meteorologists on the Swiss team, which has its mission control in Monaco, will then look for a suitable weather window for the ocean flight. It will be done in two stages, with the first reaching over to Hawaii - a distance from Nanjing of 8,000km. For the slow-moving aircraft, this will entail being airborne continuously for several days and nights. In simulations done last year, the weather opening was found quite quickly, but the team recognises also that its stay in Nanjing could be a long one. "I think 10 days is the time we need to get ready. Then we need to wait for a good weather window," explained mission director Raymond Clerc. "That could be three days; we could have to wait three weeks - because this leg is really the most important and is very complex. To go towards Hawaii could last five days and five nights." Bertrand Piccard has been sharing the flying duties in the single-seater with his business partner, Andre Borschberg. And it is Borschberg, the trained engineer, who will take the controls for the leg to Hawaii. So far, Solar Impulse has covered about 7,000km since leaving Abu Dhabi, UAE, on 9 March. Solar Impulse has set two world records for manned solar-powered flight on its journey so far. The first was for the longest distance covered on a single trip - that of 1,468km between Muscat, Oman, and Ahmedabad, India. The second was for a groundspeed of 117 knots (216km/h; 135mph), which was achieved during the leg into Mandalay, Myanmar, from Varanasi, India. No solar-powered plane has ever flown around the world.